The Dedication of the RAFLAA Monument was held at 14.00hrs on Wednesday, 18 July 2018, at Locking Parklands. There were some 70 attendees including: 25 RAFLAA members and wives; the Mayor of Weston-Super-Mare; Chairman of Locking Parish Council; St Modwen Southwest Regional Director; St Modwen Senior Development Manager; Representative from Homes England; Branch Secretary of W-s-M RAFA; Squadron Leader John Clark (Retd.) ex-Flight Commander, RAF Locking. A full list of guests can be seen here. Guests and association members assembled at the Locking Parklands Community Centre (originally the RAF Locking church). At the appointed time the piper, Robert Cunningham, led attendees to the monument where RAFLAA Chairman, Hans (Tiny) Kuhle, gave a welcome address. 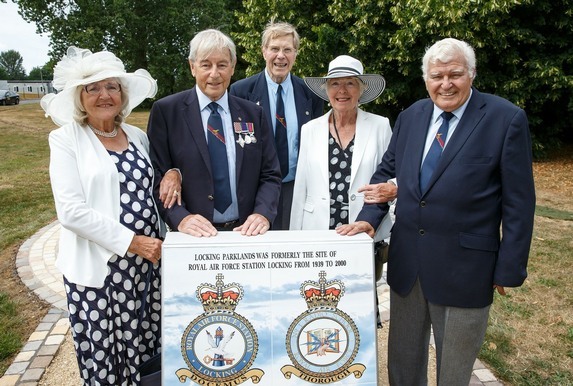 The dedication was led by RAFLAA member The Reverend Robin White (86th), which was followed by a speech and the unveiling of the monument by the RAFLAA President, Air Commodore Martin Palmer (Retd.). Reverend White concluded the dedication with a blessing. The piper then led attendees back to the community centre where a buffet lunch was served whilst members of the Locking Parklands Community Choir entertained with traditional songs.